I fell in love this summer – with chickens. It started with chickens appearing all over my sketchbooks. Sometimes they lived in a chicken coop or met in the park to play chess. They looked like pirates, sea captains and school bus drivers. One, intensely interested in exoplanets, clucked his way onto a rocket ship. I had a vision of large paintings of plucky chickens exploring the universe. The vision blossomed into a fantasy – a whole gallery of paintings, and maybe a children’s picture book! This was getting serious. Half-completed projects tumble out of a box in my studio like the souvenirs of failed love affairs. Contour drawings, value studies, reference photos, receipts for supplies I’ve never used. What if the chickens ended up here, too – sandwiched between faded photographs of bantams and red jungle fowl? But love blossomed – and demanded a trip to the art supply store. I bought Golden Open acrylics and experimented on canvas, watercolor paper treated with clear gesso, and Strathmore 500 illustration board. Here’s a watercolor sketch treated with gesso. Over-painted with acrylic. It’s definitely time for painting lessons. Illustration board was better – easy to use and forgiving. 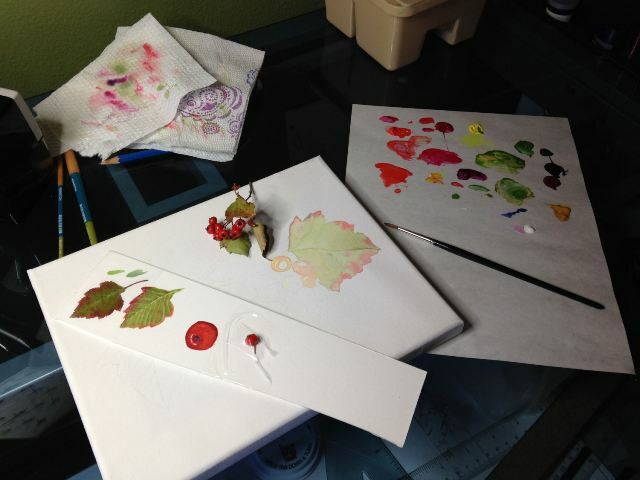 But when a friend introduced me to watercolor canvas panels, I fell in love again. –wait–what happened to the chickens? My summer crush is turning into a smoldering affair with acrylic paint. And if it all goes wrong? If acrylic paint breaks my heart? The cat is keeping my colored pencils warm. This entry was posted in Uncategorized and tagged acrylic, chickens, painting, sketch, watercolor canvas on October 27, 2014 by chubbstr.